I got the key, I got the secret someone once sung. But I'm pretty sure they weren't singing about the same key as me. No, the key or keys I talk about do not unlock a door, but they do help unlock clues which help us identify various insects. For example, most of us can point to a hoverfly and say, 'that's a hoverfly'. Yet, there are around 260+ species of hoverfly in the UK alone, or in the case of bumblebees there are 24 species, 225 for solitary bees, 250 wasps, 35 for woodlice, 600+ for spiders, ~6500 for flies, ~4000 for beetles, 6000+ parasitic wasps and so on and so forth. As you can imagine, if you have a general interest in these things, or you want to find out about a certain habitat, you need to know as far as possible what species are in the area. Doing this can give pointers as to how the habitat is, for example, you may find a species of invertebrate that prefers polluted water than clean water. So this could tell you that the water course or habitat your studying is in decline. A key is a bit like a list of clues that lead to an answer. For example, in the case of hoverflies, the first thing we look at is the front of the thorax (the main body where the wings attach) and the head. Is the front of the thorax visible or is it hard to see because the head is concave in shape? If it's the former, we move on to the next key. However, if it's the latter, then it's possibly going to be one of the flies of the following tribes: Syrphini, Bacchini or Paragini. If it is the latter, we then look at the keys of each tribe to point us to the relevant species. If it is the former, then the next key asks us to examine the wing venation. These are the veins and cells in the wings. Believe it or not, there are many different types of wing venation. In fact, wing venation is used by bat workers to identify pipistrelles in the hand. 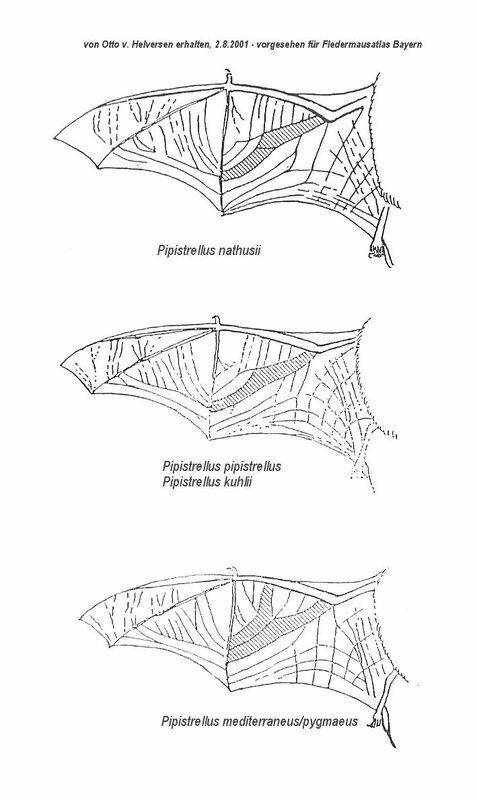 There are three different species of pipistrelle bat in the UK, (Pipistrellus pipistrellus, P pygmaeus, and P nathusii), and each one has a slightly different wing venation to the other. 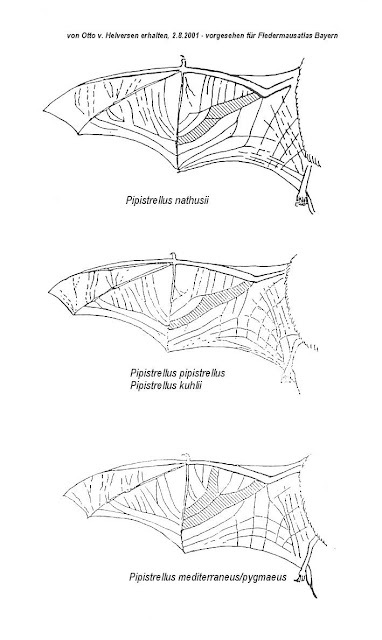 The different wing venation in pipistrelle bats. So, as you can see, each little clue points to a different species, whether it be hoverfly or bat or whatever it is that you're looking at. A common sight amongst our flowers at the moment are bumble bees. Maybe you have a plant in your garden that is well visited by these wonderful little creatures on a daily basis, but what type of bumblebee is it? If you can, take a picture of it. Don't be frightened by it, it doesn't want to sting you unless you start prodding or poking it. Then go to this great little online key from the Natural History Museum and click on the two types of key at the bottom to start identifying what bees you have. It really is simple and like I said earlier, there are only 24 species of UK bumblebee, so it shouldn't bee (sorry) to hard! Let me know how you got on. Another new and FREE app! Now I know I've been banging on about the Big Butterfly Count the last few posts, but hear me out once more because it just got even more easier to do (if that's possible). 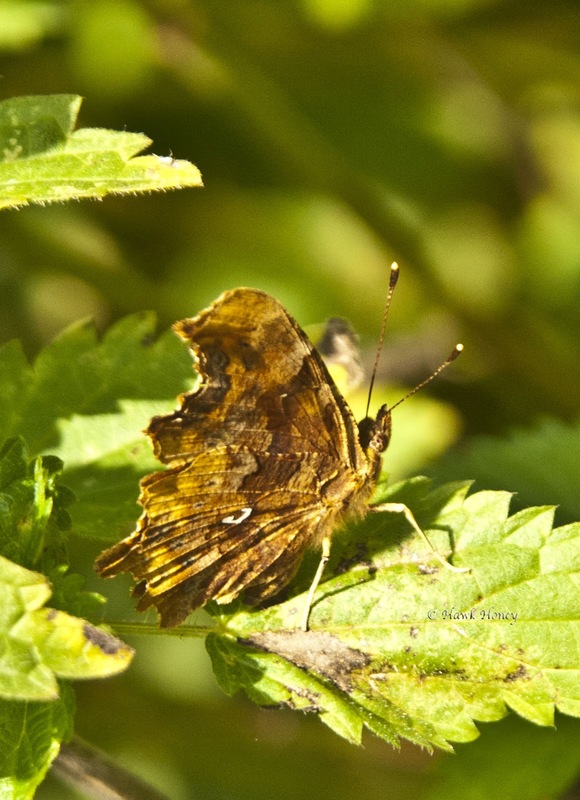 They (Butterfly Conservation) have just released a FREE APP for the iPhone and soon for the Android that allows you to participate in the Big Butterfly Count whilst you're out and about, so no need to carry around an identification sheet, it's all on your phone so again, no excuses. The iPhone app, could it be anymore simple!!! I thought I'd give it a go on a walk this afternoon down on Suffolk Wildlife Trust's Newbourne Spring Nature Reserve. It's somewhere I've never been and didn't find out about it till this morning. Found it on their website. It's only about 15 minutes from where I live, so no long journey in a hot car, thankfully. Although the website gives a post code which takes you to the Fox Inn pub, do not park there, they don't like it. Instead, with the pub on the left, just drive a little way past it and take the first left (Woodbridge Rd) and first immediate left again. Here you'll find parking for about 8 cars. From here, there's only one way to go into the reserve, along a well made path. The dappled shade from the trees gave some respite from the blazing sun and insects of all sorts were visibly going around their business. 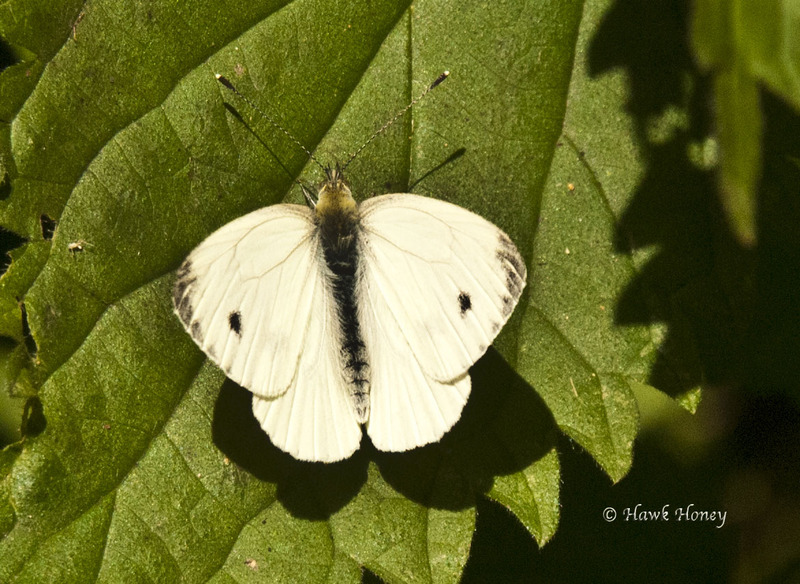 There were lots of Small and Large whites whizzing about too. 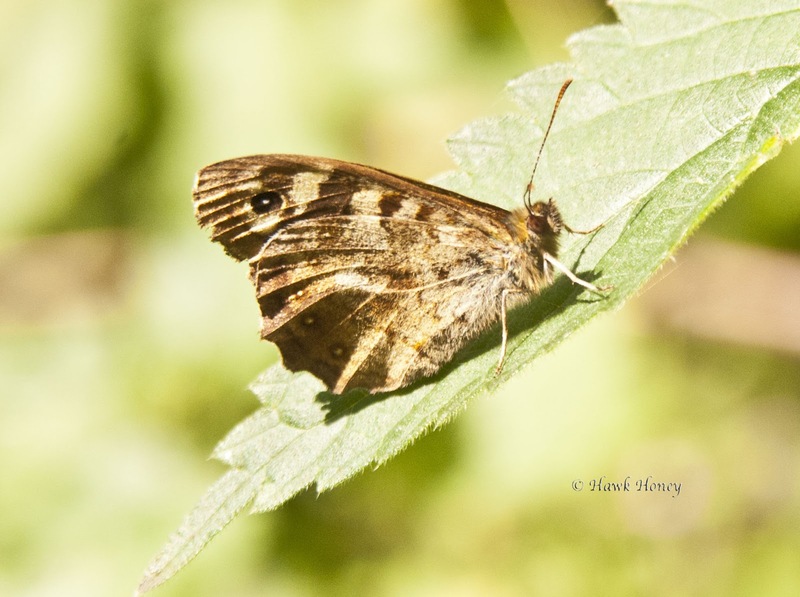 At one point, as I was walking, I looked to the side of me where there was a bed of nettles and there flying beside me were six, yes, six Ringlet butterflies! Amazing. 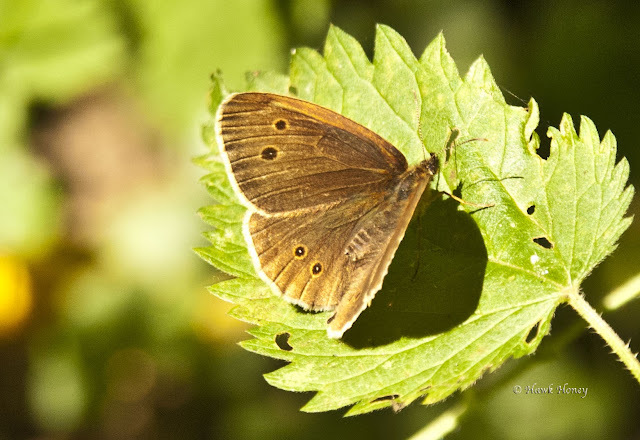 Ringlet (Aphantopus hyperantus) basking on a leaf. Eventually, I found a nice shady spot where I could try out my butterfly count app and boy, what a test it was going to be. My nice shady spot for the count. To cut a long 15 minute story short, I counted 105 butterflies in 15 minutes. It was truly unbelievable, the majority were Small Whites (Artogeia rapae), with Large Whites (Pieris brassicae) and Ringlet (A hyperantus) also showing in large numbers. There were also a few Meadow Browns (Maniola jurtina) in there and 1 Gatekeeper (Pyronia tithonus). Unfortunately, I can't give you the exact figures of what I saw because once you submit your survey, that's it, its gone. There's no record of what you saw and where you saw it and I think this is a design flaw with this app. I only know there was 105 butterflies because there was the option for me to share my findings on Twitter and Facebook and that's what it says "I just spotted 105 butterflies for Big Butterfly Count..." I think it would be better if it said something like 'I just spotted 15 Sml Whites, 12 Lge whites, etc" Or at least give you a record of it, which is something you would have if you had done it on paper. I'm not fat, in fact, injuries aside, I'm quite a healthy fellow. Yet this gate was obviously made for people of an extremely slim nature, maybe size 0, or size 00, the sort of ladies you might find strutting a cat walk, not walking a woodland path. Usually, in situations like this, I would've just jumped over the gate, however, I'm suffering from a back/neck muscle/nerve type injury at the moment. So, jumping over the gate was a big no no, as knowing my luck, I would've got over to have my injury spasm and find I couldn't get back again. So,this part of the reserve was off bounds to me. Maybe Suffolk Wildlife Trust would like to address the issue?? This one was a little shy and refused to open his wings to show his splendid colours, but I will be back and I will get a shot, I promise. That's it for this week, I hope you have a lovely, smashing weekend.